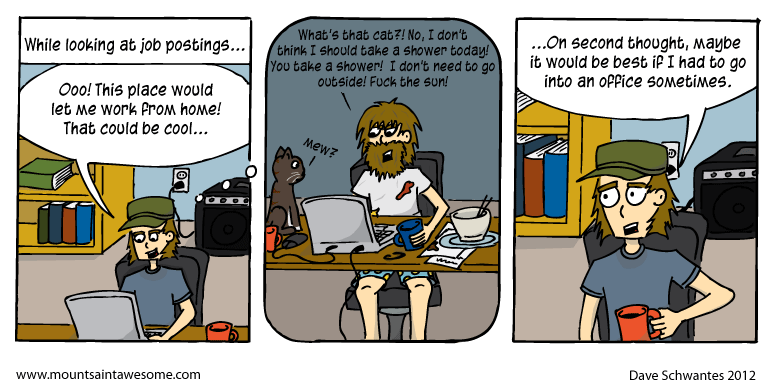 This comic is the logical continuation of a previous comic I did about working from home. Honestly, after I started drawing the 2nd panel I realized that that is what a lot of my day looks like now. At least I still leave the house sometimes. I do probably talk to the cat too much. It's weird. I've been posting some diary style comics on the Mount Saint Awesome Facebook page lately. Hopefully those make up for my terrible update schedule these days.